This ‘Year of the Sea’ blog highlights the initial bourgeoning of English hydrography, focusing on the work of Captain Collins, who also surveyed the Welsh coast. In 1657 hydrographer and printer Joseph Moxon ventured into what had traditionally been the Dutch preserve of marine chart production with A Book of Sea Plats. These charts of European waters were nevertheless of Dutch origin. John Seller envisaged an atlas containing charts surveyed, drawn, engraved, and printed at home. He was appointed Royal Hydrographer and remarkably secured a successful thirty-year order forbidding the import of Dutch ‘Waggoner’ charts (see Waghenaer’s ‘Spieghel’, our preceding maritime blog). Alas, Seller’s ambitions were beyond the means of an individual bookseller and instrument maker. Samuel Pepys later wrote that private individuals were incapable of such huge undertakings, and yet from 1671 Seller’s The English Pilot with its defects and partially refreshed old Dutch plates, progressively ousted ‘Waggoners’ from England. In 1680 Captain Greenvile Collins began lobbying for a British survey. Collins, an experienced Royal Navy captain and skilled hydrographer was commissioned by King Charles II in 1676 to survey home waters and was promised significant assistance. 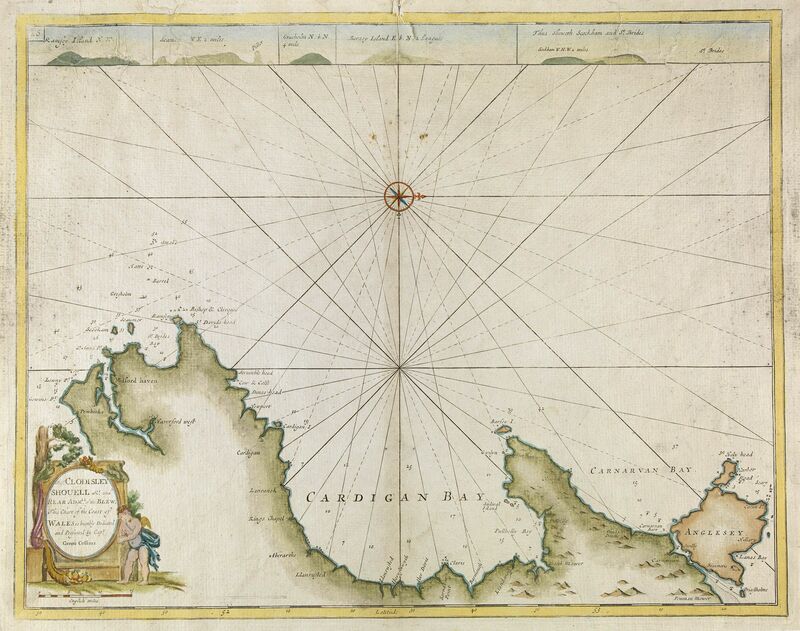 Collins’s seven year survey began in 1681 and in 1693 his charts were published in Great Britain’s Coasting Pilot. The survey demanded rigorous coastal measurements and the precise coordinates of headlands. Progress was bedevilled by financial shortages and the waning interest of supporting bodies. Collins’s proposal to survey Ireland in its entirety was not realized. Collins’s Pilot was the first systematic survey and first maritime atlas of British waters to be engraved and printed in London from original surveys and included forty-eight charts together with sailing directions, tide tables and coastal profiles. Despite inaccuracies and shortcomings the work was an immense advance for British navigation and validated Collins as one of history’s foremost hydrographers. The Pilot, little altered, was issued between 1693 and 1792 and on at least twelve other occasions. Inevitably, by 1792, it was regarded as requiring considerable improvement. The Library holds a 1779 copy of this atlas and several individual charts variously dated. 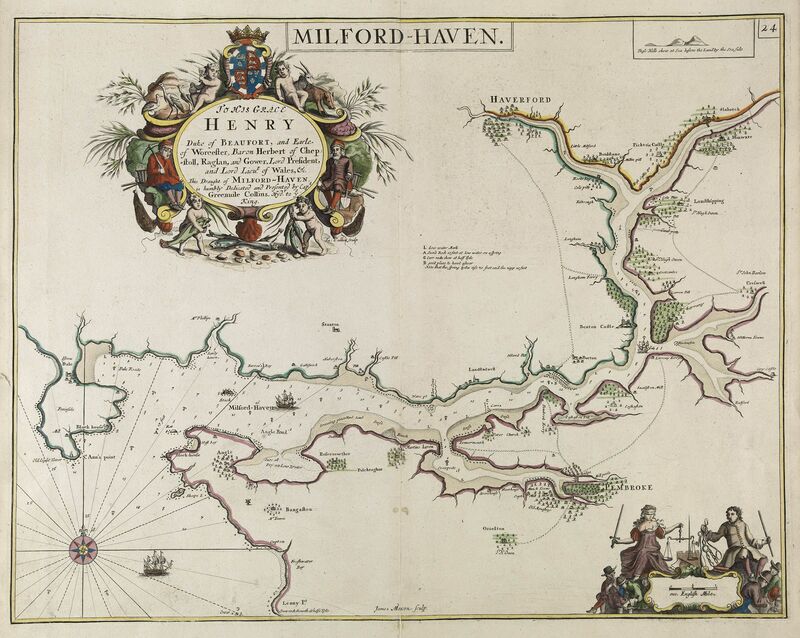 Our illustrated charts of the western coasts of Wales and Milford Haven are dated 1693.